Yes, the XAU/Yahoo advance/decline line did confirm the recent move to new recover highs in both gold and silver. So all is well now if you're a gold bug, and it looks like the tradable low expected for December came in a little early. Thanks Fib, always appreciate your posts. Well...you (and a couple of others) did "stay the course" on the long side, and now you're being rewarded...nice job. As we all know, the single most important factor when it comes to direction of the metals is that they are joined at the hip with the direction of interest rates. With the cumulative data in the interest rate sensitive issues putting on a show this past week, that's all this asset class needed to get in gear to the upside as cheaper money allows liquidity levels to rise. And as liquidity levels rise, this is also good news for equities as investment capital has to find a home eventually. 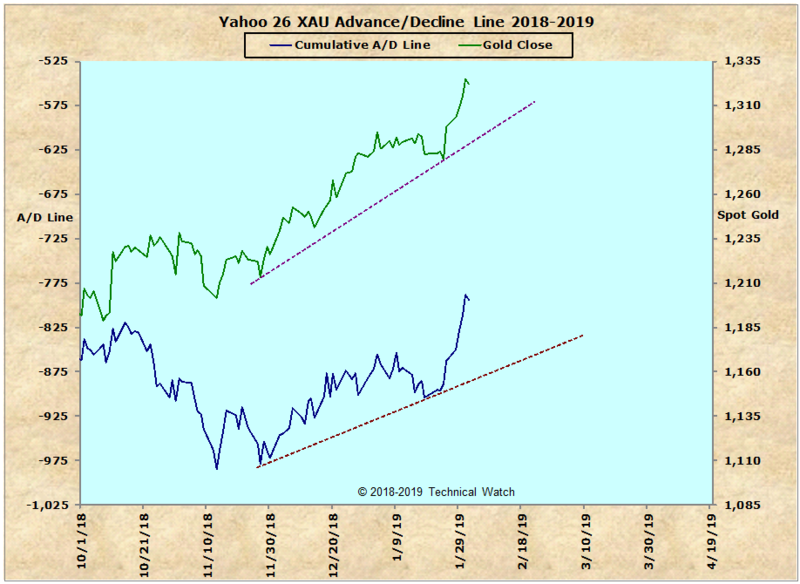 Since the XAU A/D line is a measurement of a basket of stocks, they too were finally able to break free from the bear market default that devoured everything in sight in December. Let's now see how she runs. P.S. the PM BPI is still under 30%, but it tends to lag direction due to the type of charting technique that's being measured, Point and Figure. Chart that predicted the low in August and was posted on this board, is projecting out to late 2021 for the high on this run. nice call Russ! Did you heed your own advice? Yes I did, I have been long NUGT since August. Edited by dougie, 05 February 2019 - 01:49 PM.